Podcasting is an essential part of #FinCon18. The 4-day #FinCon18 schedule is jam-packed and helping you get the most out of your experience is extremely important to us. So we created this Podcaster’s Guide to help you navigate the event for podcasting-specific opportunities and learning experiences. Sign up for a Pro Pass and participate in Pro Networking to connect with brands for advertising deals. It’s kinda like Speed Dating…but there’s no dating involved. With a Pro Pass, you’re able to schedule 10-minute one-on-one meetings with brands so you have the potential to come to #FinCon18 with at least 18 appointments already booked. And if you run out of time to meet with all of the brands, you can network with the remaining ones during the Speaker/Pro Mixer that evening. Attendees tell us the Pro Pass pretty much pays for itself in relationships made during Pro Networking. Plus, you can meet more potential advertising partners in FinCon Central (the expo hall) as you strike up conversations with key brands that could turn into future revenue for your show. We set up your mics, provide a digital recorder, and give you the chance to record your podcast LIVE at the conference. All you’ve gotta do is show up to the Ally Podcasting Stage and start recording. Special thanks to Ally for sponsoring this area. Spots are limited, so get your application in as soon as possible. Submit here. Join the community and get your questions answered by people just like you. Professional speaker, best-selling author, and host of the Retired Inspired podcast, Chris Hogan has been working under the Ramsey Solutions brand for more than a decade. Often referred to as “the guy with the booming Darth Vader voice,” Chris has coached highly-paid professional athletes and musicians, trained other financial coaches, and now travels around the United States to speak in large venues. We have an entire track of breakout sessions dedicated to podcasting topics. Learn from the experts on the Podcasting Track who will cover topics like “How Smaller Shows Can Profit” led by Julie of Fire Drill, “Unconventional Tactics to 3 Million Downloads in 16 Months” taught by Brad Barrett and Jonathan Mendonsa of Choose FI, or “How to Create a Podcast that Stands Out and Gets Noticed” with Rich Jones and Marcus Garrett of Paychecks and Balances and more! By attending Anatomy of a Podcast Launch, the 1.5 hour workshop on Wednesday afternoon led by Bobbi Rebell, CFP and podcast pro Steve Stewart, you’ll have the opportunity to gather creative ideas that will help you think through your podcast launch and have an actual plan to move forward after #FinCon18. Bobbi Rebell wrote the book, “How to Be a Financial Grownup” and wanted to create a podcast to support the brand. She didn’t want a traditional interview podcast so she looked for help from friends in the FinCon Community. Steve Stewart heads up the FinCon Podcast Network and edits some of the top podcast shows in our community. Then, once you’ve attended that workshop, stop by Pete McPherson’s breakout session to learn a dead simple podcast production system for newbies. Pete from Do You Even Blog? will help you walk away with additional tools to add to your beginner podcasting arsenal. Now in its fifth season, the Money & Media Podcast helps you stay up-to-date on all things related to the conference. You’ll hear about exciting opportunities inside FinCon Central (formerly known as the Expo Hall) and exclusive interviews with FinCon speakers and influencers in the community. So, I can meet a virtual assistant in person before I even hire them? YES! The Freelancer Marketplace will help you create business relationships that will carry your podcast show to the next level. Find niche-specific professionals that already understand your needs and our community. Get paired with seasoned podcasters that will keep you reinventing the wheel when it comes to podcasting. Go to lunch with them on Saturday and spend time learning from their mistakes and successes as you discuss the goals of your show with someone who has been where you are. Discover new podcasters from the FinCon community! A conversation in the hallway at could turn into a future podcast episode on your show. Create key relationships that will potentially get your foot in the door as a guest on other shows. Pumped for Julie from Fire Drill’s session. Thank you for putting this together Team FinCon! 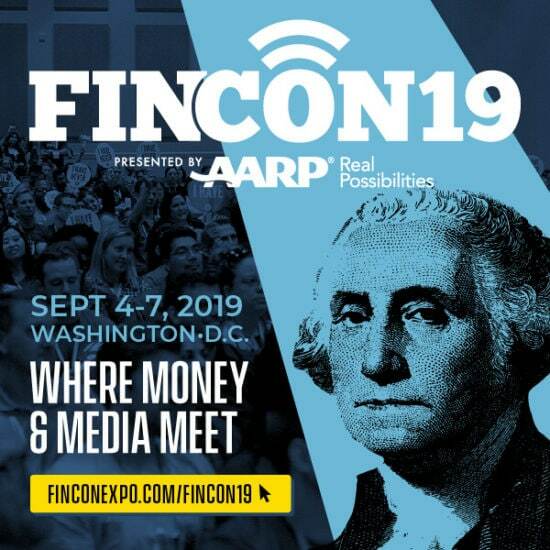 Can’t wait to see everyone at FinCon18!